This event is open to all boys who will be entering 4th grade through 12th grade in September. Players will participate in drills, learn offensive/defensive/transition schemes, with the possibility of playing half-field scrimmages run by our alumni playing in college and current Red Devils. The entire group will be split into squads according to their ages and an appropriate level of checking according to NFHS rules will be enforced with each group. All participants MUST be members of US Lacrosse for insurance purposes. 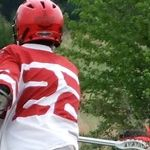 Please enroll or renew at uslacrosse.org and provide your son’s membership number on his registration form. Participants must have and wear the required equipment listed on the next page. They must also be prepared for warm weather with refreshments, sunblock, etc. The cost of the camp has been reduced to just $30 per player and $20 for each sibling of a registered player. Each player be entered into the equipment raffle at the end of camp. Please see our website at rvlax.webs.com for additional information. Avoid late fees by registering by June 30th.